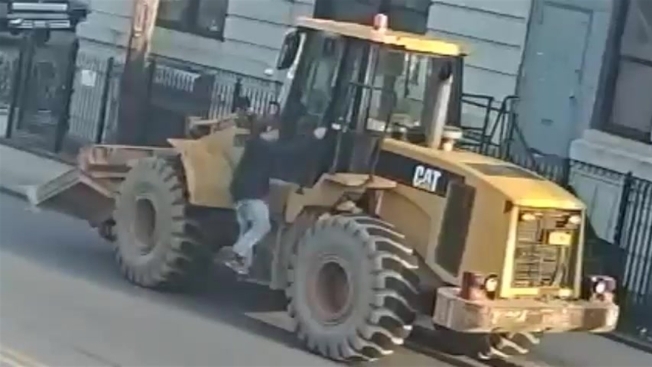 Police are looking for a suave burglar who pulled off a "Mission Impossible"-style heist involving a skylight, a Caterpillar payloader and a Brooklyn storage facility. Cops say the suspect broke into New York Self Storage on Metropolitan Avenue shortly before 7 a.m. Saturday by squeezing through the skylight in the facility's roof. He stole about $1,000 in cash and a MacBook laptop before fleeing and was last seen operating the Caterpillar payloader. No one was hurt, but the crime -- the operation if not the haul -- was the stuff of movies. Surveillance video shows the alleged thief, a cigarette poking out of his mouth, glare at a security camera with a smirk, then cover it up. Later, he's seen getting out of a huge payloader, hoisting up his pants and looking both ways as he calmly crosses the street. Anyone with information about the suspect is asked to call police.